life. She was born in England in 1815 and was the legitimate daughter of Lord Byron, quite a feat in itself because the famous poet fathered all of his other children with women who were not his wife. Still, being born legitimate is not an achievement for the baby, who has no choice in the matter. Ada Lovelace (born Augusta Ada Byron) had to be an unusual woman to earn a reputation of her own and gain lasting fame. And she was. Despite having an irregular upbringing with a mother so focused on hatred for her husband, Byron, that she had little time for her daughter, Ada Lovelace had a good education. Her mother encouraged tutors to teach Ada mathematics as a way to ward off the tendency toward madness that she believed affected Lord Byron and his family. Ada took to numbers and became a competent mathematician as well as mastering several languages. Ada Lovelace moved in high social circles. She became Baroness King when she married William King. The couple had three children, but Ada still had time to continue her friendships with both men and women. She became an avid gambler and tried to find mathematical models to help her and her friends find formulas which would increase their winnings. That, unfortunately, didn’t work and she went deeply into debt. However love of mathematics continued. 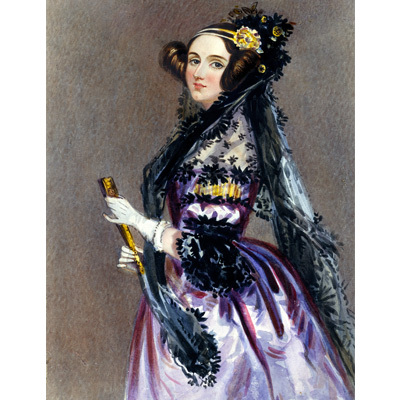 It is very fitting that we now have an Ada Lovelace Day celebrated every year in mid-October. The day is dedicated to honoring the past achievements of women in science, engineering, technology and mathematics and to encouraging young women to enter these fields. You might wonder what Ada Lovelace has to do with Wikipedia, but the connection is the gender-bias that has resulted in having far more men than women represented in the encyclopedia. Not only are women under-represented in Wikipedia, they are also under-represented in technology and scientific studies. Girls today have very few role models who inspire them to enter the STEM fields of study. Let’s hope the students at Brown University will come up with some articles that may inspire young girls today and in the future to become the scientists, technologists, engineers and mathematicians that are needed to keep our future growing.